The August/September issue of Crochet me is out, yay! Go here for the pattern. Those baskets are beautiful! Thanks so much for all of the wonderful patterns. I finished two book thongs tonight despite the fact that I’d never worked with thread before! Love these- Donna you rock! Very very nice! Did it hurt your hand crocheting with the jute. I made one last night. Very quick and easy, but I couldn’t find 2 ply twine, so I used 3 ply. 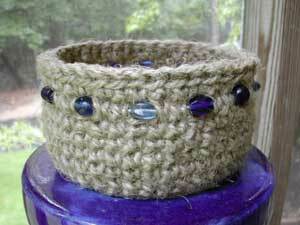 My DH wants me to make more baskets for the plants. Very nice! And the beads just set off the jute perfectly. LOVE the baskets!!! Hmmm… another thing to add to my “to do” list. 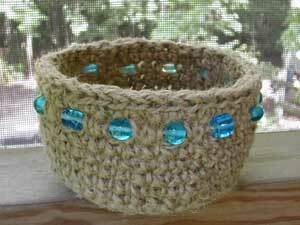 I love the way the plain jute really makes the pretty beads stand out. I love fancy beads, but never know what to do with them. I think I’ll have to buy some now! I’ve started making one of these, and I’m a little confused. I was hoping you would help me out. On rounds 7 through 10, the instructions say not to join, but they don’t say to turn, either. I’m afraid I don’t understand what I’m supposed to do if it’s neither of those. Very pretty! ;) The bottom one looks like the beads are glowing. 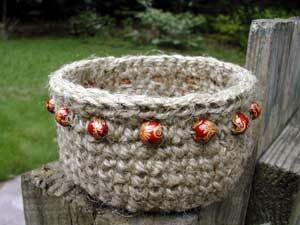 Lovely baskets, Donna! And congratulations! The baskets are too cute! I’ll have to hit the local home store and get some jute and beads. Your baskets look wonderful!! Great job on them and congrats on the inclusion of them in Crochet me! !